Enterprise application source code, independent of languages and platforms, is a major source of vulnerabilities. This talk is designed to focus on enterprise architecture and application analytics to discover vulnerabilities. One of the CSI surveys on vulnerability distribution suggests that in 64% of cases, a vulnerability crops up due to programming errors and in 36% of cases, due to configuration issues. 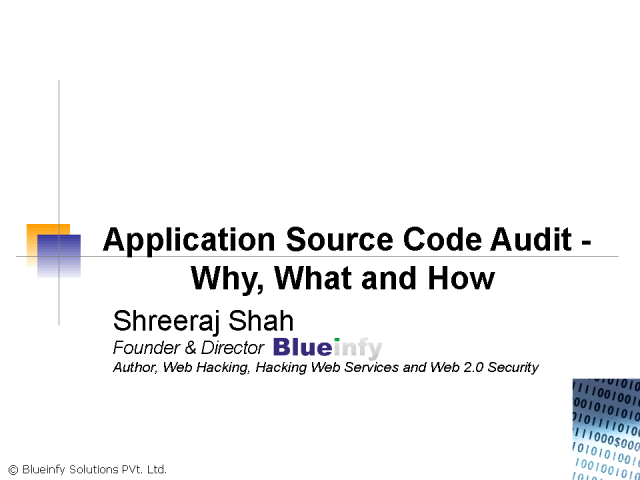 We will be covering analysis and audit techniques, for assessment and review of enterprise application source code. Essentially all three important steps of the audit will be addresses – Why it is needed, What to do and how to achieve.